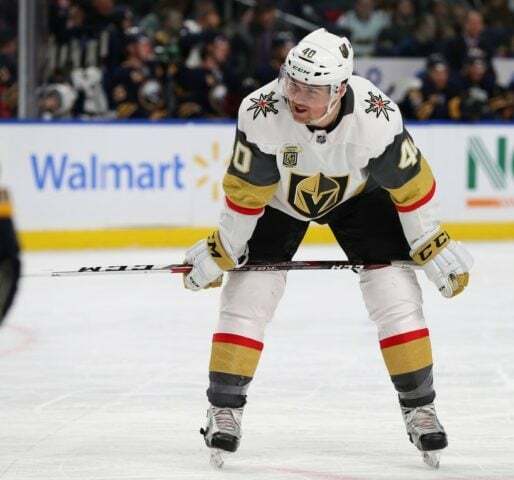 GLENDALE, Ariz. — Brandon Pirri and Paul Stastny each had a goal and an assist and Marc-Andre Fleury made 29 saves in the Vegas Golden Knights’ 5-1 victory over the Arizona Coyotes on Sunday night. Brad Hunt, Cody Eakin and Ryan Carpenter also scored to help Vegas win its third straight and extend its points streak to six games. The Golden Knights have won five of six games against Arizona since Vegas entered the NHL last season. Vegas improved to 3-4-1 in the second game of back-to-backs this season. Arizona played for just the fourth time in a back-to-back situation and lost the second game for the first time this season. A large following of Golden Knights fans made plenty of noise for the visiting team in the most recent installment of the fledgling rivalry, and saw their team take control with three goals in the third period. The third was a short-handed goal from Carpenter, his second goal of the season. Just when the Golden Knights’ first power play ended, Pirri got a rebound behind the net and backhanded the puck back toward the crease, where Stastny was waiting to stuff it in the net at 3:35 of the first. Pirri has seven points in the six games this season. Arizona’s Nick Schmaltz appeared to tie at 1 with 8:54 left in the second period, but the goal was reviewed on a coaches’ challenge and overturned for offside. Vegas made it 2-0 with 3:57 to play in the second. Brad Hunt tipped a loose puck in front, and Smith got to it first for a shot that zipped past Kuemper. Kuemper finished with 33 saves. The Coyotes took advantage of a 5-on-3 power play with two Golden Knights in the penalty box to get their lone goal at the 2:58 mark of the second. Alex Galchenyuk scored, with Oliver Ekman-Larsson getting the assist. Ekman-Larsson reached 312 career points, passing Keith Yandle for the most points in franchise history for a defenceman. Galchenyuk ran his points streak to five games, in which he has totalled seven points. Eakin edged the puck over the goal line at 4:21 of the third for his 12th goal of the season, and Pirri scored on a breakaway less than three minutes later. Notes: Coyotes F Brad Richardson missed his third straight game with an illness. … D Kevin Connauton was shaken up and went back in to the dressing room late in the first period but returned for a shift in the final seconds of the period and stayed in the game. … Vegas F Valentin Zykov, just claimed off waivers on Saturday, was scratched. So were D Jon Merrill and F Tomas Nosek, who missed his first game since Dec. 20. … F Alex Tuch was given a penalty for a check to the head when he drove a shoulder into Arizona’s Nick Cousins, which led to the Coyotes’ power-play goal in the second. Knights: Hosts Los Angeles on Tuesday night. Arizona: Hosts Edmonton on Wednesday night.